– Power produced by geothermal, biomass, biogas, and small hydro generators can be easily dispatched, meaning it can be either increased, decreased, or controlled to remain fairly constant. – Wind resources are often more available at night. – The variability of wind and solar power generation leads to challenges in power system operations and planning. – The contribution towards total generation from eligible renewable resources also varies seasonally. 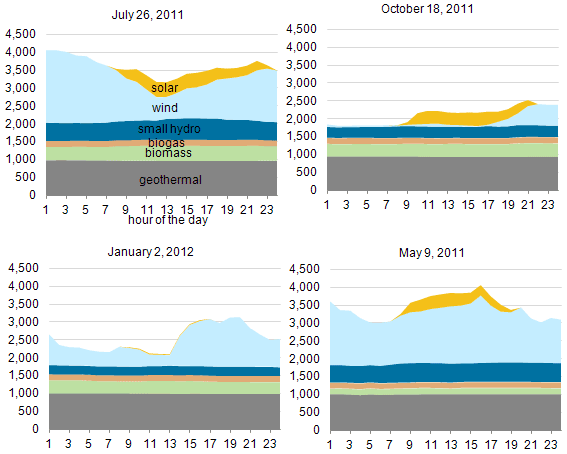 For the dates charted above, the amount of renewable generation as a percentage of the total generation ranges from 8% on Oct 18, 2011 to 14% on May 9, 2011.